How to Use Excel Keyboard Shortcuts? Excel Keyboard Shortcuts allow you to do things with your keyboard instead of using your mouse to increase your speed & to save time. ALT key on the keyboard is the master key, which is present on both side of your Spacebar key, helps to use shortcut key for various task. It helps out or reduces the usage of the mouse & and its number of clicks. Keyboard shortcuts are an essential alternative for mouse. Shortcut keys in Microsoft Excel help you to provide an easier and usually quicker method of directing and finishing commands. In Excel Keyboard shortcuts are commonly accessed by using ALT, Ctrl, Shift, Function key and Windows key. When you press the Alt key, you can observe below mentioned Ribbon tab showing shortcuts keys to press e.g. H in Home tab. If you press, ALT+H, it is further categorized, Excel will display icons, where you can see the shortcut keys for various groups appearing under ribbon tab. Let’s check out how Excel Keyboard Shortcuts works, it is categorized based on the usage of ALT, Ctrl, Shift & Function key. There are multiple Excel Keyboard Shortcuts. Let us understand the uses and working of keyboard shortcuts. Excel Keyboard Shortcuts helps you to provide an easier and usually quicker method of directing and finishing commands. 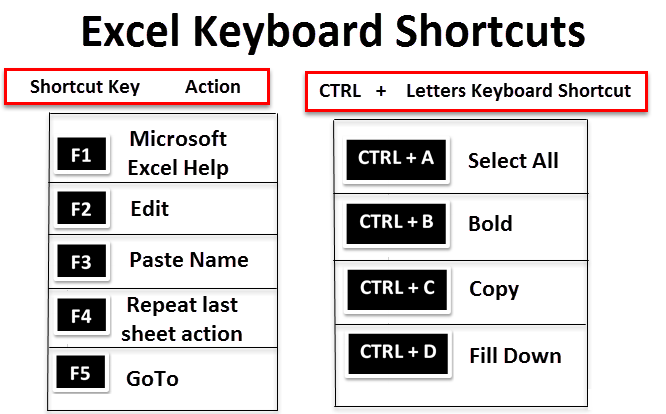 Excel Keyboard Shortcuts also helps out or reduces the usage of the mouse & and its number of clicks.